Kabul’s writ has never run strong in the remote southern plains of Helmand province. Further south, across the border in Pakistan, lies the equally remote Noshki-Chaghai region of Balochistan province. Since 9/11, this region has been in turmoil. In the Baramcha area on the Afghan side of the border, the Taleban have a major base. The chief commander is Mansoor Dadullah. From there they control militant activities as far afield as Nimroz and Farah provinces in the west, Oruzgan in the north and parts of Kandahar province in the east. They also link up with groups based in the Waziristan region of Pakistan. The Helmand Taleban, unlike comrades elsewhere in Afghanistan, have been able to capture territory and hold it, mostly in the southern parts of the province. They constantly threaten traffic on the highway that connects Kandahar with Herat. Kandahar has the symbolic importance of being the spiritual centre of the Taleban movement and also the place of its origin. The supreme Taleban leader, Mullah Mohammad Omar, made the city his headquarters when the Taleban came to power in 1996. 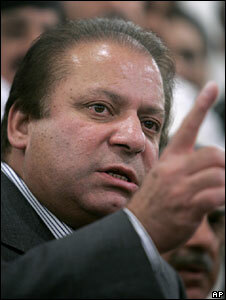 Top al-Qaeda leaders, including Osama Bin Laden, preferred it to the country’s political capital, Kabul. As such, the control of Kandahar province is a matter of great prestige. The first suicide attacks in Afghanistan took place in Kandahar in 2005-06, and were linked to al-Qaeda. Kandahar has seen some high-profile jailbreaks and assassination bids, including one on President Karzai. The Afghan government has prevented the Taleban from seizing control of any significant district centre or town. International forces have large bases in the airport area as well as at the former residence of Mullah Omar in the western suburbs of Kandahar city. But the Taleban have a strong presence in the countryside, especially in southern and eastern areas along the border with Pakistan. Afghan and Western officials have in the past said the Taleban have used Quetta, the capital of the Pakistan province of Balochistan, as a major hideout as well as other Pakistani towns along the Kandahar border. Mullah Omar is probably in hiding in Kandahar or Helmand. Afghanistan’s Zabul province lies to the north of Kandahar, along the Toba Kakar mountain range that separates it from the Pakistani districts of Killa Saifullah and Killa Abdullah. The mountans are remote, and have been largely quiet except for a couple of occasions when Pakistani security forces scoured them for al-Qaeda suspects. Reports from Afghanistan say militants use the area in special circumstances. In early 2002, Taleban militants fleeing US forces in Paktia and Paktika provinces took a detour through South Waziristan to re-enter Afghanistan via Zabul. Occasionally, Taleban insurgents use the Toba Kakar passes when infiltration through South Waziristan is difficult due to intensified vigilance by Pakistani and Afghan border guards. Zabul provides access to the Afghan provinces of Ghazni, Oruzgan and Kandahar. There are few Afghan or foreign forces in the area, except on the highway that connects Qalat, the capital of Zabul, to Kandahar in the south-west, and Ghazni and Kabul in the north. South Waziristan, a tribal district in Pakistan’s Federally Administered Tribal Areas (Fata), is the first significant sanctuary Islamic militants carved for themselves outside Afghanistan after 9/11. Militants driven by US troops from the Tora Bora region of Nangarhar province in late 2001, and later from the Shahikot mountains of Paktia in early 2002, poured into the main town, Wana, in their hundreds. They included Arabs, Central Asians, Chechens, Uighur Chinese, Afghans and Pakistanis. Some moved on to urban centers in Punjab and Sindh provinces. Others slipped back into Afghanistan or headed west to Quetta and onwards to Iran. But most stayed back and fought the Pakistani army during 2004-05. The eastern half of South Waziristan is inhabited by the Mehsud tribe and the main militant commander here is Baitullah Mehsud. The western half, along the border with Afghanistan, is Ahmedzai Wazir territory where the chief commander is Maulvi Nazir. The Mehsuds only live on the Pakistani side, while the Wazirs inhabit both sides of the border. These sanctuaries directly threaten Afghanistan’s Paktika province, where the US-led forces have a base in the Barmal region and several outposts along the border to counter infiltration. Pakistani security forces also man scores of border checkposts in the region. However, infiltration has continued unabated and the number of hit-and-run attacks on foreign troops has been one of the highest in this region. Militants based in the region are known to have carried out strikes as far away as the Kandahar-Kabul highway. The North Waziristan region is dominated by the Wazir tribe that also inhabits the adjoining Afghan provinces of Paktika and Khost. North and South Waziristan form the most lethal zone from where militants have been successfully destabilising not only Paktika and Khost, but other Afghan provinces such as Paktia, Ghazni, Wardak and Logar. Groups based in Waziristan region are known to have carried out some recent attacks in the Afghan capital, Kabul, as well. Tribal identities are particularly strong in Paktika, Khost and Paktia. During the Taleban rule of 1997-2001, these provinces were ruled by their own tribal governors instead of the Kandahari Taleban who held power over the rest of the country. In the current phase of the fighting they coordinate with the militants in Kandahar and Helmand, but they have stuck with their own leadership that dates back to the war against the Soviets in 1980s. The veteran Afghan militant Jalaluddin Haqqani is based in North Waziristan. He has wielded considerable influence over the top commanders in South and North Waziristan. He is also reported to have maintained links with sections of the Pakistani security establishment and is known to have mediated peace deals between the Pakistani government and the Wazir and Mehsud commanders in the region. Mr Haqqani is now an old man, and his son Sirajuddin has taken over most of his work. There are many Arab and other foreign fighters in North and South Waziristan. This is due to Jalaluddin Haqqani’s close links with the al-Qaeda leadership. He married an Arab woman in the 1980s. In view of the sensitivity of Waziristan region, US-led forces have set up a large base in Khost from where they conduct operations not only along the Waziristan region to the south but also in parts of the border region in Paktia and Nangarhar provinces to the north. As the Pakistani military strategists who organised Afghan guerillas against the Soviets in the ’80s discovered to their delight, Kurram is the best location along the entire Pakistan-Afghanistan border to put pressure on the Afghan capital, Kabul, which is just 90km away. But because the region is inhabited by a Shia tribe that opposes the Taleban for religious reasons, the Taleban have not been able to get a foothold here. Analysts say this is the main reason why the Taleban have taken so long to improve their strength in areas around Kabul, such as Logar and Wardak. Some militant groups in the Khyber tribal district have carried out attacks on foreign and Afghan troops in Nangarhar province. But the Pakistani government has kept a close watch on them. One reason may be to curb the ability of these groups to block the highway through Khyber which serves as the main conduit for supplies to international forces in Afghanistan that come via the Pakistani port of Karachi. Analysts have long suspected Pakistan’s Bajaur tribal region to be the hiding place of Osama bin Laden, Ayman al-Zawahiri and other top al-Qaeda leaders. The Mohmand and Bajaur tribal districts are also believed to be the stronghold of Gulbuddin Hekmatyar, one of the main Afghan guerrilla leaders of the 1980s. Mr Hekmatyar fought the Taleban in 1990s, but after 9/11 started working with them. The actual extent of cooperation is not known. The groups in Mohmand and Bajaur are members of an umbrella organisation which is headed by South Waziristan’s Baitullah Mehsud known as the Tehreek-e-Taleban (Pakistan Taleban). Militants based in Mohmand and Bajaur have been striking at installations and supply lines of international forces based in the Narai region of Afghanistan’s Kunar province. In recent months, they are also reported to have crossed the Hindu Kush foothills to carry out attacks on foreign troops in the Sarobi, Tagab and Nejrab areas around Kabul. For a long time the Taleban were unable to maintain sustained pressure on the country’s south-central highlands. 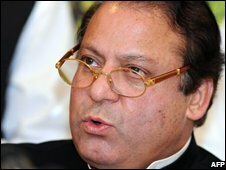 But with safe sanctuaries in the border region – from the Baramcha area of Helmand province in the south, to some parts of Pakistani Balochistan, the Waziristan country and Bajaur-Mohmand territory to the east – the Taleban finally have the capacity to challenge the government in this region. The roads in Ghazni and Oruzgan are not as safe as they were a couple of years ago and officials are losing the will to maintain the government’s authority. Training camps run by al-Qaeda and Taleban groups have multiplied in secure border regions over the last few years. Safe havens have also afforded the militants endless opportunities to find new recruits. The Waziristan region is also known to be a haven for young suicide bombers and trained in remote camps. The Taleban also appear to have had access to sophisticated military equipment and professionally drawn-up battle plans. The strategy appears to be the same as in 1980s – ‘death by a thousand cuts’. Sporadic attacks on the security forces and the police have grown more frequent over the years, and have also crept closer to Kabul. At the same time, the Taleban have destroyed most of the education infrastructure in the countryside, a vital link between the central government and the isolated agrarian citizenry. Oruzgan has mostly come under pressure from groups in Kandahar and Helmand. These groups, as well as those based in the Waziristan-Paktika-Khost region, have also moved up the highway via Ghazni to infiltrate Wardak on the left and Logar on the right. Safe and quiet until less than two years ago, both these provinces are now said to be increasingly infiltrated by Taleban fighters. The same is true of militants putting pressure on Kabul from Sarobi and Tagab in the east, with their tentacles stretching back to Laghman, Kunar and Bajaur. A former princely state, Swat, in northern Pakistan, was governed by a British era law which a court declared unconstitutional in early 1990s, triggering a violent campaign for the introduction of Islamic law in the district. The insurgency was effectively put down in 1994, but it re-emerged after 9/11, and was joined by many battle-hardened militants from Waziristan, Bajaur and the neighbouring district of Dir. During a 10-month long operation that still continues, the security forces have disrupted the infrastructure of the militants but is still to clear them out of the area. The militants have been targeting the security forces, the police, secular politicians and government-run schools. 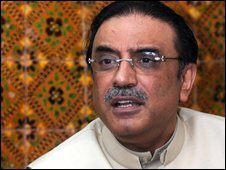 Asif Ali Zardari, the widower of former Prime Minister Benazir Bhutto, has won Pakistan’s presidential election, election officials say. Sources told our correspondent that Mr Zardari will visit China soon as president. 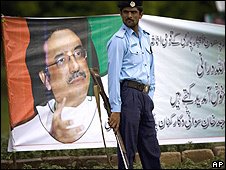 Mr Zardari faces an Islamist insurgency and economic problems that are threatening Pakistan’s stability. Meanwhile a bomb has killed at least 12 people near the city of Peshawar and injured many more. Although official figures for are still to be released for Punjab province and the national assembly, election commission officials say Mr Zardari has already gained the 352 votes he needs to be declared overall winner. In Sindh province, Mr Zardari won all 65 votes. In North West Frontier Province he got 56 out of the 65 votes. In Balochistan province he was heading to win about 60 of the 65 votes.